Enquire or book a trip along Cần Đước - Cái Bè - Cao Lãnh - Châu Đốc. Boarding at noon in Can Duoc. Welcome drink, introduction to the ship and crew, check into the cabins. Depature towards My Tho. Lunch is served as the Bassac is on its way. The Bassac makes its way through the Cho Gao canal, as you enjoy the scenery from the upper deck. Rendez-vous with a local boat for a visit of the Ben Tre islands: rowing through the arroyos shaded with water coconut trees, on a horsecart through to a honey farm where you will taste the local production. Boarding back by dusk, welcome drink, then departure towards Cai Be. The Bassac drops anchor for the night. The Bassac gets under way to soon arrive in Cai Be. Departure from Cai Be to Binh Hoa Phuoc Island while lunch is served on board. Dinner is served as the Bassac gets under way towards the My Thuan bridge then towards Sa Dec. The Bassac drops anchor at the entry of Sa Dec for the night. 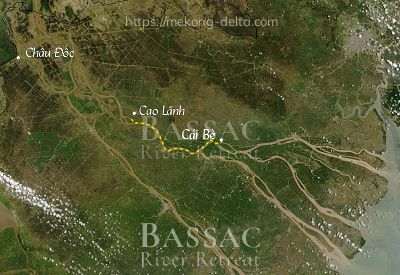 The Bassac continues to cruise upstream Tien Giang river towards Cao Lanh. Transfer onto a local boat for a visit of a Tram forest where Viet Cong Xeo Quyt base once was nestled, a moving token of the harshness of combat during the Vietnam war. Boarding back about noon with a refreshing drink. By mid-afternoon, the Bassac drops the anchor for the visit of a late XIXth century Franciscan monastery on shore. After boarding back before dusk, and a welcome drink, the Bassac resumes her trip. The Bassac drops anchor on Song Hau, the Bassac river, for the night, after rounding Cho Moi district through the Vam Nao river. Breakfast is available from 6:30 on, as the Bassac resumes her progress towards Chau Doc, upstream of river Bassac. Upon arrival at Chau Doc, check-out and transfer to a local boat for the visit of a floating fish farm on the way and a village of the muslim Cham minority, then final diembarkment. End of services by mid-morning on shore at Châu Đốc. Upon disembarking, you may skip the visit and transfer right away to a speedboat heading towards Cambodia and Phnom Penh. This takes leaving the board a bit early but saves you a night in Châu Đốc. The trip takes about 5 hours and puts you right in the middle of Phnom Penh on the Sisowath pier at lunch time. A very practical and fast access to Cambodia. You may even make your visa to Cambodia at the frontier.